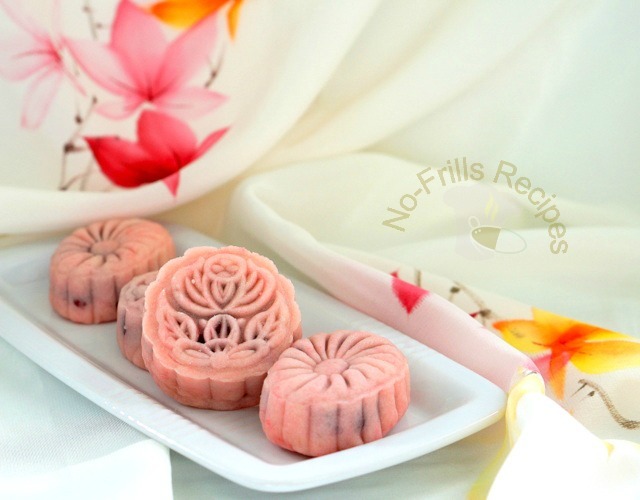 These non-baked Cranberry Snowskin Mooncakes make an ideal gift for your friends during the Mid-Autumn festival. 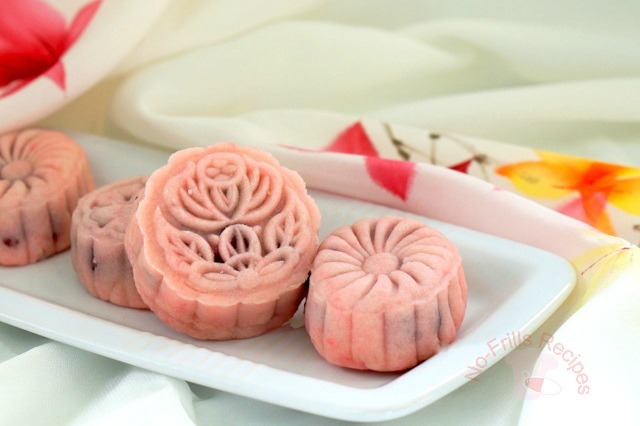 Making these mooncakes is not so time-consuming as you don't need to bake them and they do look cute and pretty when made in different colours. 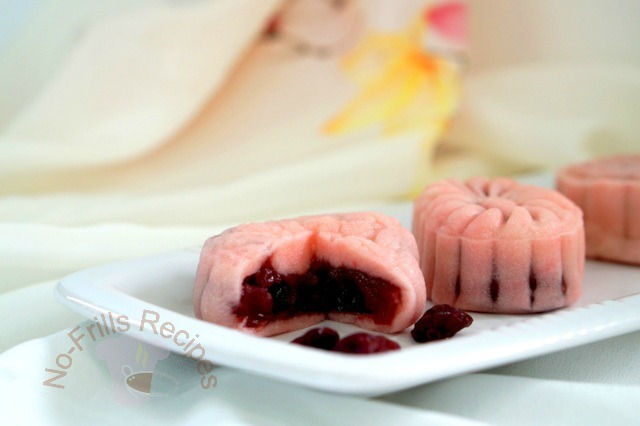 These Cranberry Snowskin moonies remain soft and chewy even after being chilled in the fridge for four days. Sift kao fun and icing sugar into a mixing bowl. Rub in shortening till it resembles bread crumbs. Measure 125 ml chilled pandan water, add in a drop or two of pink colouring, mix well. Gradually add in chilled pink coloured water and mix to form a smooth dough. (You may need more or a bit less water). Knead lightly till it doesn't stick to your hands and is malleable. Cover and let rest for about 20 mins. For a 50 gm mould, divide dough into 14 portions of 24 gm each. Roll into a ball. Divide paste into 25 gm each. 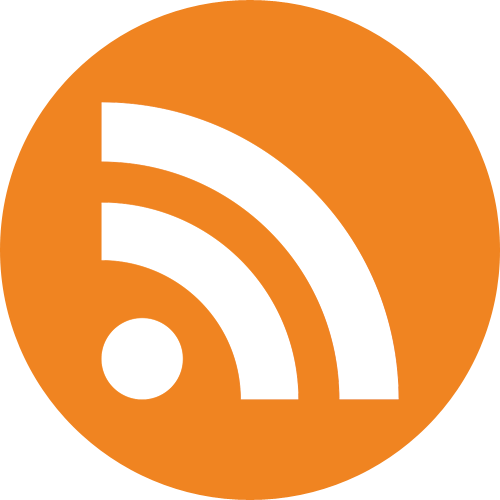 Roll into a ball. 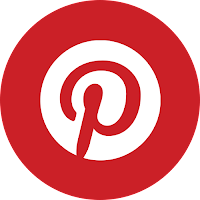 Lightly flatten the dough with a rolling pin, the edges thinner than the centre, put in the ball of paste, wrap it up and place it into the mould. 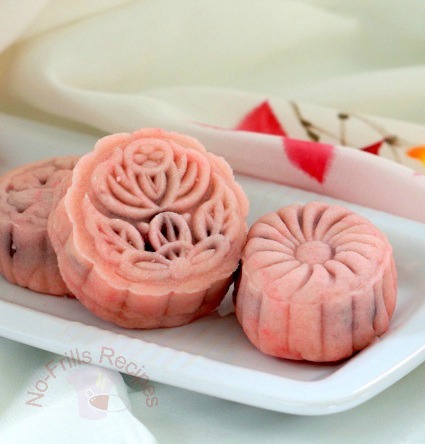 Stamp out the snowskin mooncake. Place snowskin mooncakes into a container and put a piece of paper kitchen towel over the snowskin mooncakes to absorb any condensation. Cover the snowskin mooncakes and chill in the refrigerator. with your friends and loved ones!